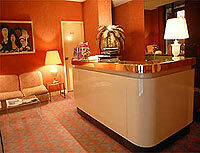 Hotel Sophie Germain, Paris, France. Area information. Save up to 42% by booking online! The Sophie Germain hotel is located in the 14th district of Paris, near the Denfert-Rochereau Place and the Daguerre market street. Denfert-Rochereau Place is one of the central points in Paris and is located very close to Montparnasse train station. The guests will have an easy access to tradeshows of Villepinte by RER B (35min) and the Porte de Versailles (15 min).